Scout Kid has been very interested lately in the concept of ancestors and how old species are. Trying to explain the phylogenetic tree of life to a four-year-old isn’t the easiest, but BBC Nature has this cool, free-download poster, which is a place to start. I think he might still be a little young for exploring the Tree of Life Web Project, but I have it waiting in the wings for when he’s a little more literate. When we were on our honeymoon, the Partner in Crime and I visited a planetarium in Seattle one day. 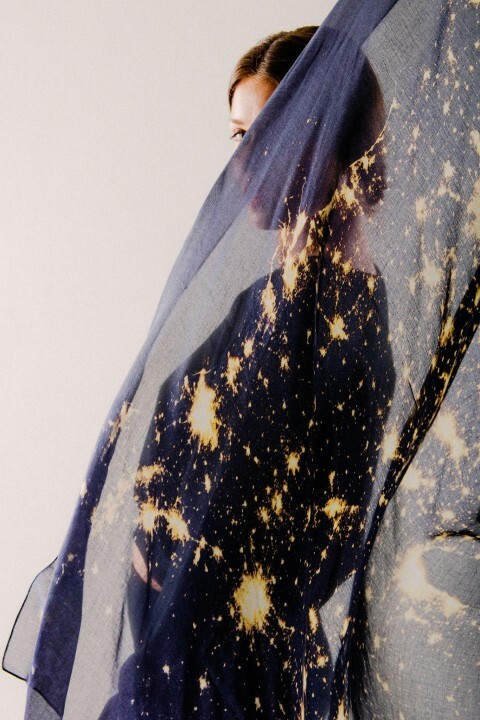 The show happened to be about light pollution, and it’s been nagging at the back of my mind ever since. The fixes are so simple, yet the scale of the problem is so large that it seems unlikely it will ever be addressed. Yet think of what we could all gain! 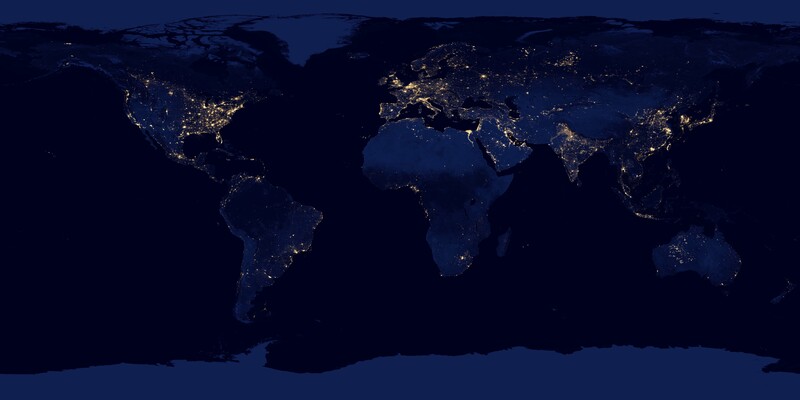 Aside from the positive effects on wildlife and energy usage, what a magic to once again be able to look up and see the Milky Way from inhabited areas. However, I knew there were some areas we could up our game. One of the things I wanted to avoid, though, was unscientific nutritional advice. There’s so much advice floating around in the name of health that is unsupported or just plain wrong. *cough*GMOS*cough* I found Authority Nutrition, which links supporting studies through all it’s articles, and that helped, but they still sometimes get off-track, and they also focus way more than I’m interested in on weight loss versus overall health. 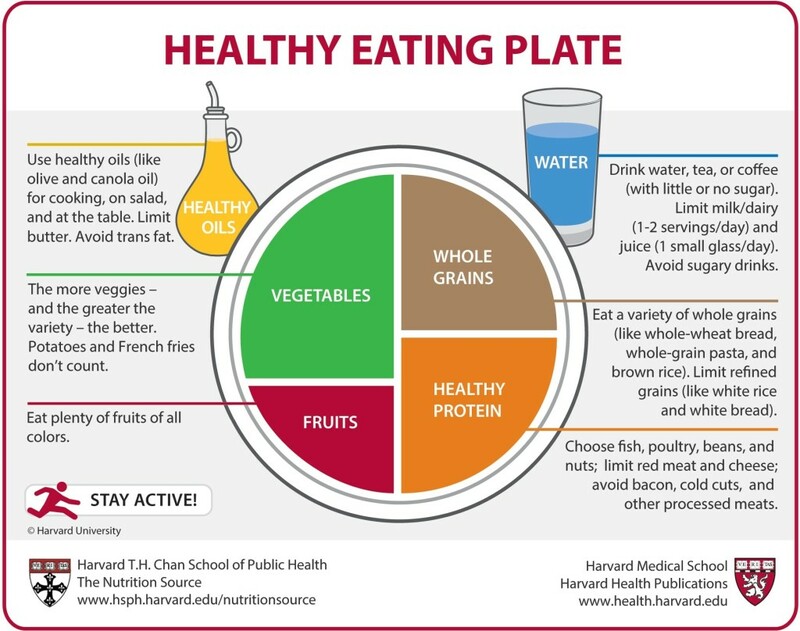 When I happened on the Harvard Healthy Eating Plate, though, something just clicked. So much nutrition advice can feel conflicting, or burdening, or restricting, but this just feels easy. Although we pretty much ignore the advice about bacon and butter, everything else has been easy and enjoyable to incorporate without feeling like I have to buy all kinds of unusual/expensive specialty items or demonise all the ordinary food at the grocery store. Simple to remember, research-based, and freeing– our crisper drawers are full and we’re happy campers. Experience the charm of gravity assists! We’re currently polishing up the rental house here in Georgia; you know, little things like putting laminate over the bare concrete floors and painting over an apparent lifetime of scuffs + the world’s literal worst paint-edging job. The boys’ room here is all fresh and lovely now, with a bright blue coat of paint of the smudged grey and pretty wood-look laminate floors, but it does still need a little something. 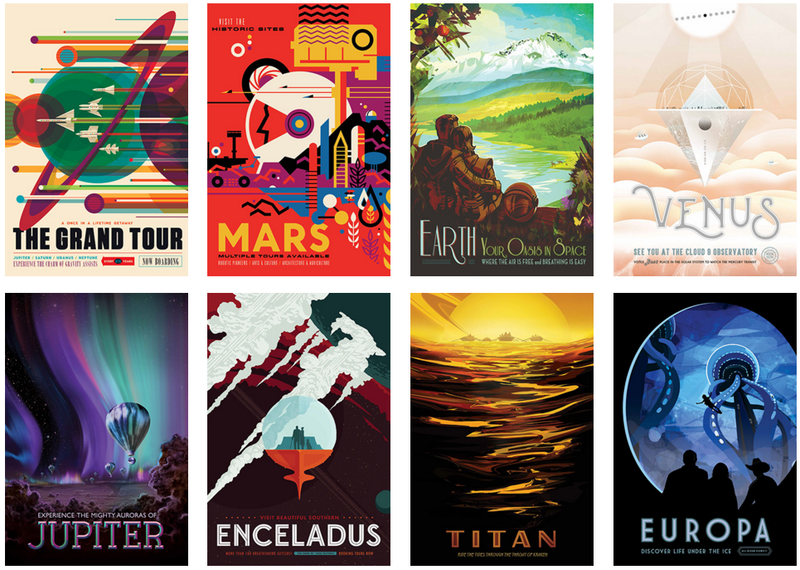 Serendipitously, I stumbled across these travel posters from NASA’s Jet Propulsion Lab– and they’re free to print! 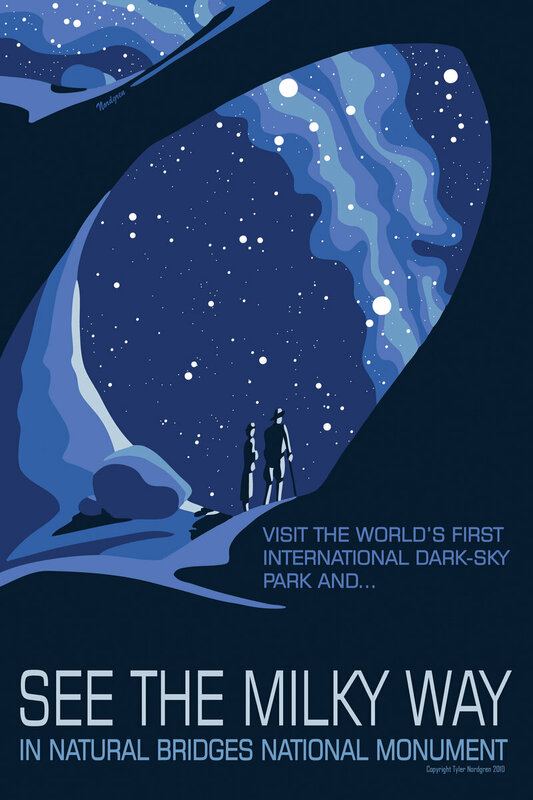 We’re probably going to grab The Grand Tour and Enceladus for the boys’ room, but Skydiving a Super Earth and the Venus cloud observatory are also wonderful. I was super-stoked to find Teachers Pay Teachers the other day. Basically, it’s a bunch of teachers sharing their classroom resources for all ages and grades, and you can buy or download PDFs of activities and lessons for every subject. My wishlist is already as long as my arm, but I started with this Health and Nutrition for Little Kids book. There’s no particular order it has to be done in, so we just jumped in. Today we learned about lungs. Here’s what we did. -Watched this great little TED-Ed video about the basic workings of the lungs. Because it’s not geared to three-year-olds, I paused it quite often the first time through as we breathed in and out slowly, held our breath, and answered any questions Scout Kid had. 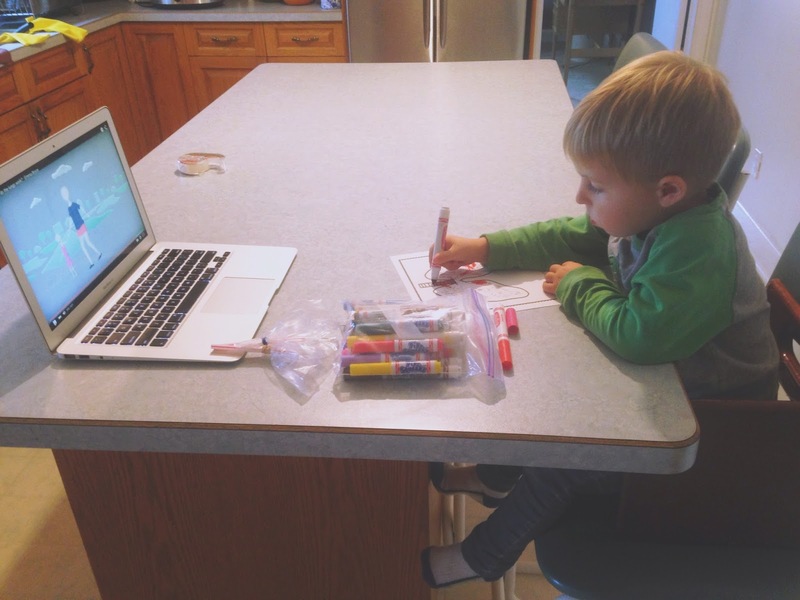 He watched it through again while he coloured the worksheet. -Coloured in the lungs worksheet from the Health and Nutrition Book. Scout Kid’s colouring is is a little half-hearted, like, “oh, here, I coloured two little spots, I think that should do it!”but he was enjoying it so whatever. -Made the accompanying craft: fit two straws into two plastic baggies, secure the tops with elastics, and voila! Lung demo. It’s dead simple but Scout Kid loved seeing them in action. 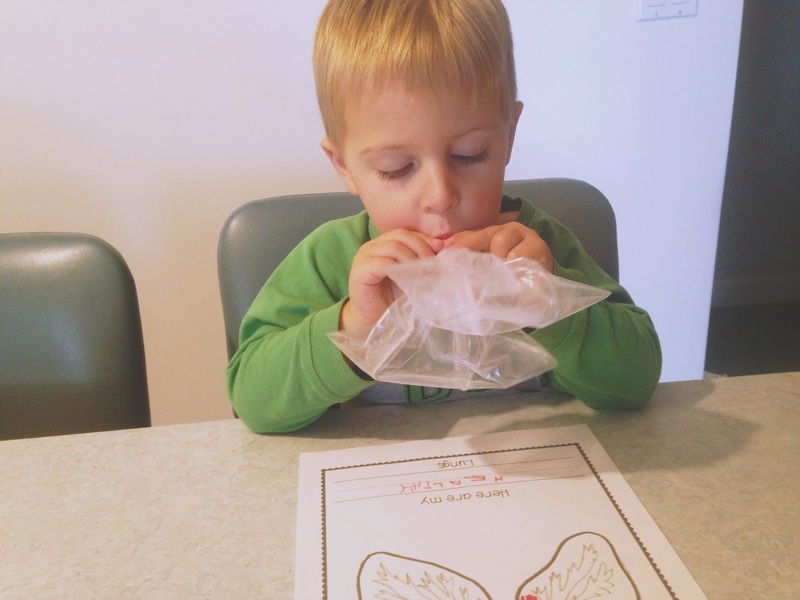 We taped them loosely onto the sheet so they’re handy next time he wants to demo his respiratory system. Trying to get back into the swing of doing regular homeschooling activities now that the school year is started again. We do have a few regular things: weekly piano lessons with my sister + practices, weekly art lessons with my mama, daily Bible reading/memorization, reading, and practice counting (I’ll post about our hundreds chart another time,) and we enjoy those, but Scout Kid really gets most excited about the special activities I plan. I needed some time to get cotton balls, so we did the rest of the activity a week later; in the intervening time we kept our eyes open for cloud types as we drove or played outside. Scout Kid is a big fan of the cumulonimbus. 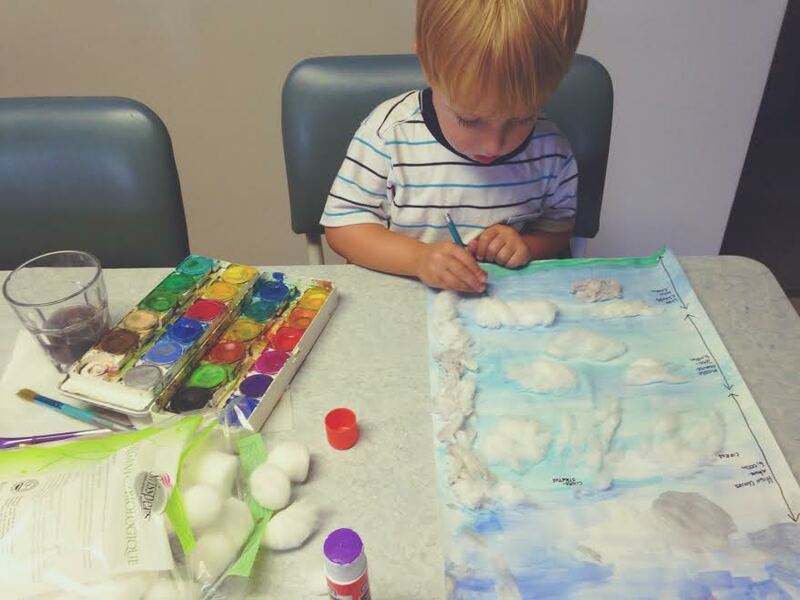 Once my cotton balls arrived, we painted a poster (Scout Kid added a moon and some stars up top there) and decorated it with all the 10 main types of clouds (there are a lot more subspecies and special types.) 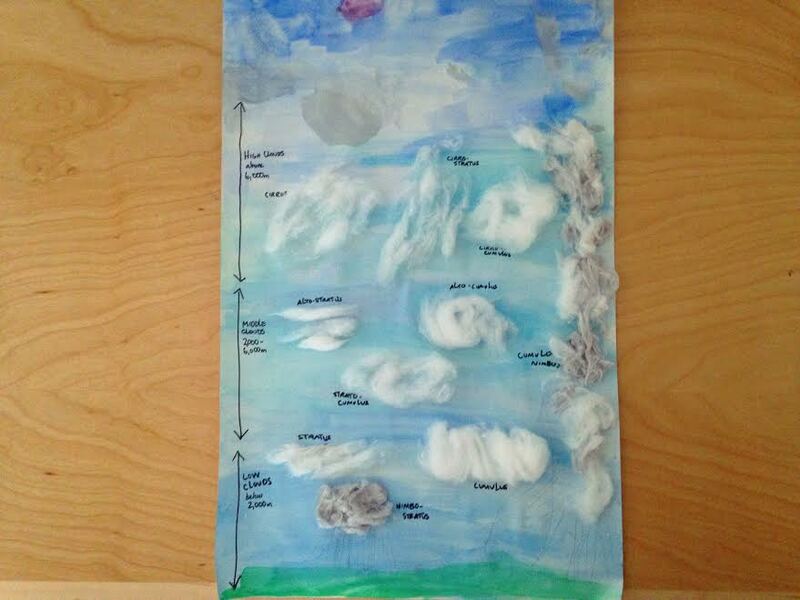 Scout Kid added the rain to the nimbostratus and cumulonimbus clouds, and I labelled everything. There’s lots more to learn, so we’re excited to keep talking about it– clouds are more interesting than I was previously aware. -Looked at a picture of the six types of simple machines: wedge, pulley, wheels and axle, lever, inclined plane, and screw. -Talked about how simple machines make work easier for us. I briefly summed up what each machine does in simple terms. 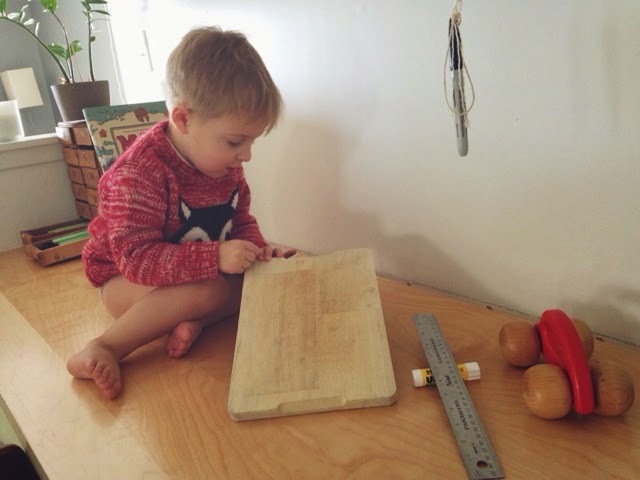 -Hunted around the house for things we could use to build some examples of simple machines, built them, and tested them out. -Watched this video of a Rube Goldberg machine using all the simple machines. Scout Kid was fascinated; we watched it over and over and he attempted to replicate it with our machines. I was glad we got to this topic as Scout Kid has a growing obessession with making pulleys, and this will only expand his scope. I’d like to revisit this topic, and maybe build our own simple-machines Rube Goldberg machine.